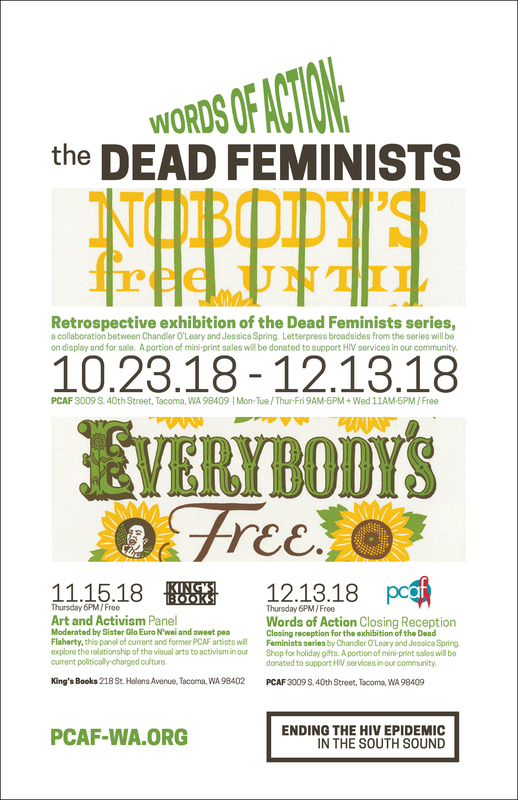 10.23.18 – 12.13.18 Retrospective exhibition of the Dead Feminists series, a collaboration between Chandler O’Leary and Jessica Spring. Letterpress broadsides from the series will be on display and for sale. A portion of mini-print sales will be donated to support HIV services in our community. Moderated by Sister Glo Euro N’wei and sweet pea Flaherty, this panel of current and former PCAF artists will explore the relationship of the visual arts to activism in our current politically-charged culture. Closing reception for the exhibition of the Dead Feminists series by Chandler O’Leary and Jessica Spring. Shop for holiday gifts. A portion of mini-print sales will be donated to support HIV services in our community.